Spring is almost here! We've seen a glimpse of it this weekend and the entire population flooded the city center. I had to circle the block a couple of times to find a parking space yesterday when I went out to meet my girls. I've been waiting so long to soak up some sun and shed all those winter layers of clothes. My best ally during this transition period? It's the over sized scarf, of course. I wear it around my neck during the day and then I can unfold it and drape it over my shoulders for extra warmth during the evening. 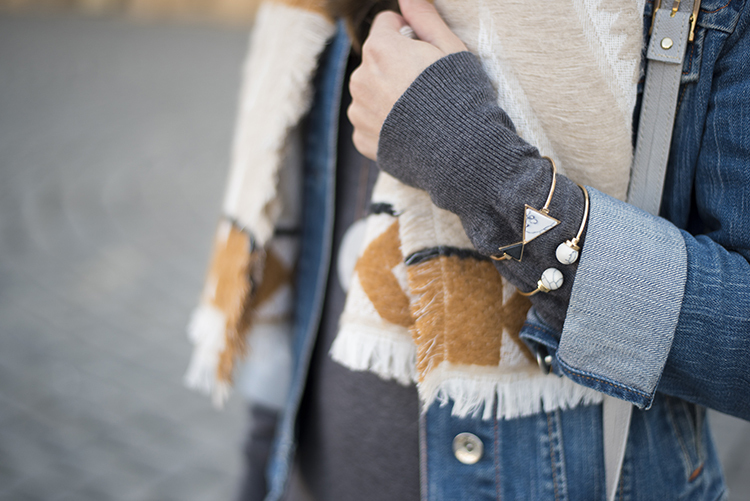 This geometric print scarf in neutral colors (and a bit of black) is my favorite at the moment. Unfortunately it's sold out in this color, but you can still find a couple of other color combos that suit you. I left the link for it below. The denim jacket is my favorite thing to wear for spring, and it literally goes with everything. I've had this one for ages, 12 years to be more precise, and because it has such a classic design it never goes out of style. I was debating last year whether to bring it up to date and adorn it with a bunch of embroidered patches to make it look more modern, but never got around to do it, and now I think it doesn't need that, it's beautiful on its own. The shoes are pretty much the same age, I bought them that same summer, and although they are so beat up and dusty, they are still my favorite pair. I guess some pieces stay with you forever, or at least until they tear and break beyond wearing, and you always go back to them like a faithful old friend. I haven't really invested in a lot of jewelry lately, mostly because my daughter is instantly drawn to whatever piece I decide to wear and tries to pull and grab it. I'm currently obsessed with these 2 marble stone bracelets and because my wrists are super thin and most bracelets tend to fall off, I love wearing them over my sweaters. They do look great don't they? Thank you for reading this letter in the busy schedule.